Anyone leading a company through a DevOps transformation will encounter minor to significant internal skepticism or lack concrete experience. 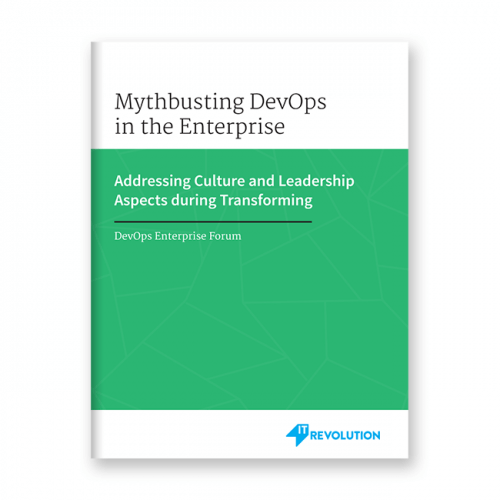 This document lists the most common leadership and cultural traps and provides high-level reassurance and evidence that DevOps practices are generally applicable and plausibly successful in enterprise environments. The DevOps movement has been primarily driven by practitioners, which is why we’ve ended up with such success at the practice level. As success and awareness have risen, we’ve now seen new challenges and questions around the path to success and applicability for larger organizations. Some have done this very well, others are struggling, and others yet have no idea where to start. We decided to confront this head on, listing the most common leadership and cultural traps for our target audience, ultimately aiming to provide high-level reassurance and evidence that DevOps practices are generally applicable and plausibly successful in enterprise environments. Our goal is to make it clear to technology leaders that transformation in enterprise environments is both feasible and desirable.